Although no different then the wooden topped Cholula bottle, TCB wanted to shed light on the condiment packet scene. For too long, we dreaded condiments that were associated with take-out. Sure, this wasn't always the case with certain establishments (think McDonald's sweet and sour, Wendy's honey mustard, duck sauce from Chinese spots) but too often we were stuck with generic no-name ketchup, yellow mustard or the occasional mayonnaise packet. These days it seems more high level condiments are finding there way into packet form (Ken's Steakhouse Dressings @ Yankee Stadium). Cholula packets are just one example. 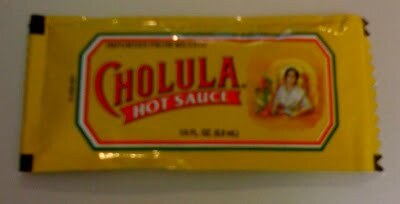 Cholula was the first hot sauce to really change the game for me. Thick, flavorful with just enough spice, in contrast to Louisiana hot sauces that are thin and vinegary. Still made in Mexico, Cholula is great on, well, anything. Tip: mixing Cholula with sour cream to make a pinkish smooth peppery crema is one of my favorite taco condiments.